2017 was a good year for crypto currency. The growing popularity and surge in value of virtual currencies has seen a tremendous increase in the number of digital currency enthusiasts and investors jumping on the cryptocurrency bandwagon. Trading digital currencies has also become a lot easier, but there’s still some confusion regarding their taxation in the US. 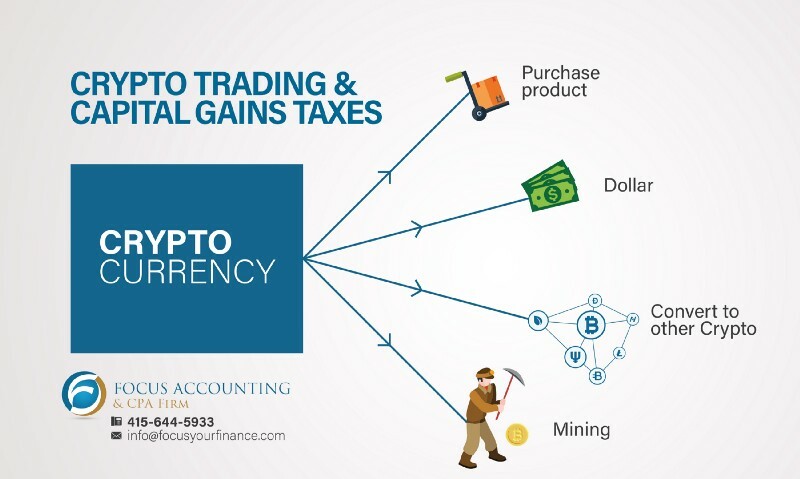 Cryptocurrencies are treated as intangible property for tax purposes. However, not all the rules for stocks and investment properties apply to digital currencies. Let’s begin with the taxable and non-taxable events of digital currencies. So what kinds of crypto trades are taxable? Trading cryptocurrency for cryptocurrency: If you exchange your Ethereum for Bitcoin, you need to pay tax. But first you need to calculate the market value of both the currencies at the time of exchange. What kinds of crypto events don’t involve tax payment? When you buy digital currency using dollars, you don’t have to pay tax. Until you sell, use or trade these digital currencies, you don’t realize any gains. A wallet-to-wallet transfer of cryptocurrency is not a taxable event. But sometimes these transfers can be mistreated as an exchange, which is again a taxable event. Therefore, you need to keep a proper record of these transactions. A small amount of cryptocurrency as a gift is not a taxable event. However, if the recipient then gets involved in crypto trading with the gifted digital currency, then the recipient has to pay tax on capital gain. For instaance, if you gift Bitcoin worth $100 and the receiver sells if for $120, then the recipient has to pay tax on the gain — $20. But if the gift amount is high, it is a taxable event. With the value of cryptocurrencies skyrocketing, the IRS has become more serious than before about their taxation. We know the IRS treats cryptocurrencies as property, which involves capital gain implications. But, how are these gains in cryptocurrency classified? In simple terms, if you hold cryptocurrency for 12 months or less and trade it for a profit, it is classified as a short-term capital gain. These short-term gains will be taxed as ordinary income tax rates. For instance, if your colleague bought Bitcoin worth $100 in June 2017 and sold it for $110 in Dec 2017, he made a short-term capital gain of $10. This short-term gain will be treated under the income tax rules. The tax rate for these kinds of short-term transactions can be as high as 39.6%. If you hold digital currency for more than a year and make a profit on the transaction, it is classified under long-term capital gains. For instance, if the same colleague decides to hold $100 worth of Bitcoin till July 2018, it will be taxed as a long-term capital gain. In comparison to short-term gains, tax rate for long-term gains will be lower but complicated in nature. The tax rate for long-term gains will be 0%, 15% or 20%. Therefore, holding cryptocurrency for more than a year is one of the best ways to minimize tax on digital currency. And if your transaction is under $600 in a year, then, according to the Cryptocurrency Tax Fairness Act, you will be exempt from the tax. And remember, you need dollars to pay the final tax on your gains.